You are here: Home � All Deals , Electronics: Computers Video Games GPS � Get a Garmin nüvi 285W/285WT 4.3-Inch Widescreen Bluetooth Portable GPS Navigator with Traffic monitor for $129.99 - Today Only. Get a Garmin nüvi 285W/285WT 4.3-Inch Widescreen Bluetooth Portable GPS Navigator with Traffic monitor for $129.99 - Today Only. 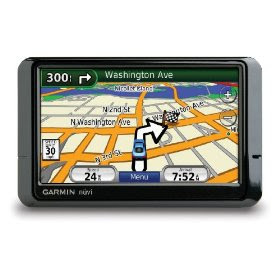 Amazon is selling a Garmin nüvi 285W/285WT 4.3-Inch Widescreen Bluetooth Portable GPS Navigator with Traffic monitor for $129.99 as a Black Friday special. Today only you can also save an extra $20 if you add the Garmin nüMaps Lifetime North America Map Update to your order as well. You will be voice-prompted with full street names on every turn and the device comes with HotFix satellite prediction. You'll also have a built-in microphone and speaker for hands-free calling via bluetooth. Read Reviews about this GPS, or see the offer by visiting this link.